Making air dried bacon is a slow process, too slow for today’s big manufacturers but it’s the only way to produce a good quality bacon. The process takes weeks, far too long for the big supermarkets as they strive to beat each other over the head on price rather than focusing on quality. I don't sell our air dried bacon directly any more, I simply make it for my own pleasure and to use in our BBQ catering business. Dry Cure – this is where the cure mix is massaged into the meat. Wet Cure (or pickle cure) - The meat is immersed in a salt solution (brine). Whichever method is used, the curing process should be followed by a process of equalisation. This is when the cure is given time to fully disperse throughout the bacon and therefore give a more consistent finish; and it is this equalisation process that takes place during the air drying. 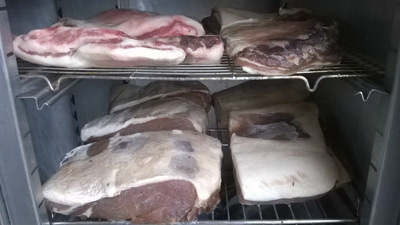 I dry cure for 4 – 7 days (depending on the cut of bacon) and then air dry for 2 weeks. The weight loss is significant during this drying time but it guarantees that when my air dried bacon hits the pan, no water comes out and it doesn’t shrivel. Moreover, there's no white goo - more about what causes white goo below. That said, we all have a choice and if you prefer, you can buy cheap mass produced bacon at your local supermarket. It's not air dried, in fact chemicals are added to speed up the curing and equalisation processes. Injection of the cure helps the salt penetrate the meat quicker (accelerating equalisation) and it also gives mass producers the opportunity to pump their bacon with water and polyphosphates that aid water retention. In other words, water added = weight added = more money per kilo of bacon. The injection process is most commonly described as "Wiltshire Cure". Sounds pleasant and traditional doesn't it? In our view, any mass produced bacon described as Wiltshire Cure should be avoided. It's the polyphosphates that exude as white goo during the cooking process along with much of the water that it was intended to retain. Next time you cook some cheap bacon, take a look at what happens. A load of water comes out as well that white stuff, it boils rather than fries and it shrivels into nothing. 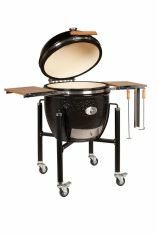 Arguably now cooked it will weigh less than a bacon rasher that has been air dried. My air dried bacon is also nitrite free and that's because I prefer to leave it out. Go back four hundred years and someone found that by adding salt petre to ham and bacon that it not only aided the preservation process but it also turned the bacon colour pink. Remember that this is before the days of refrigeration so storage temperatures would have been higher that in a modern temperature controlled environment. A metabolic reaction took place between "good bacteria" in the meat and the salt petre (potassium nitrate) that oxidised the nitrate into nitrite. It's actually the nitrite that aided preservation by inhibiting the growth of Clostridium Botulinum and also the nitrite that turned the bacon (or ham) pink. Today we have refrigeration and these cooler temperatures stop the first metabolic reaction (nitrate to nitrite) from taking place so instead, bacon curing today simply involves the addition of potassium nitrite to the cure (commonly referred to as Prague Powder #1). So why do I omit nitrite from my air dried bacon? There is evidence that when injested, nitrite is converted into cancer causing nitrosamines in the stomach. This is why there's a lot of discussion at the moment about processed meat causing cancer but at the same time, nitrites are naturally occurring in vegetables such as celery yet no one is saying "stop eating vegetables"
The counter argument is that the vegetables contain powerful antioxidants (such as ascorbic acid) that inhibit the conversion of nitrites to nitrosamines so the benefits of eating vegetables completely outweigh any potential harmful effects and it's the nitrites in processed meats that we need to be worried about. In addition there's also evidence that nitrate in beetroot can improve stamina in exercise ie. you can exercise harder and for longer. Click here to read the study. Sadly, there are many vested interests in this argument so there's study after studly coming out providing different conclusions depending on the source of the funding for the study. My view - "If in doubt, leave it out"
Bacon is kept refrigerated these days and that's a proven inhibitor to the growth of bacteria. Bacon is then cooked, another tried and tested way of making food safe to eat. So if we take this to it's logical conclusion, the only reason we would be adding nitrite would be for colour and we don't think that a good enough reason to risk our health. One last point, don't get confused between nitrite free bacon and "no added nitrite bacon" the latter tends to use celery seed with naturally occurring nitrite to get that pink colour. Our bacon is Nitrite Free. My recipe will be here soon!